If you are still doing some last minute shopping, here are some tips. Look for places with free shipping both ways - like NORDSTROM. They have gift ideas for under $25 for her, him, and your home (or hostess). MACY'S always offers free return shipping, and right now - free shipping on all orders over $25. J. CREW is offering free shipping for a limited time before Christmas. Some RED & GREEN gift ideas - like these buffalo plaid socks or polka dot mug for the hot chocolate drinker. SHOPBOP offers free 3 day shipping. Looking for designer jeans for under $100 - SAKS OFF FIFTH has a great selection and free shipping. If you are part of a FUNNY GIFT EXCHANGE - here are some gifts that are sure to get some laughs - like this parking violation, broken door bell, EMERGENCY PUBLIC RESTROOM KIT, and for those that want to share TMI. Wearing something very similar to this today! Love those boots! I just love turtlenecks, they are so cozy and warm, and solid ones like these are so versatile. Have a great weekend! Great looks! 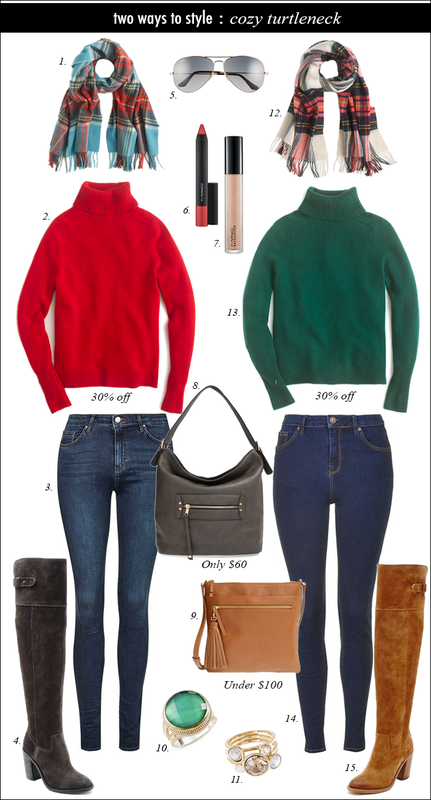 The scarves and OTK boots really amp up jeans and a sweater. love the OTK! great post babe! love the idea of a turtle neck top with a scarf! very cute!